"We contribute our successes in the Utica Shale, SCOOP, and Southern Louisiana to our employees, our world-class assets and our desire to perform better than we did the day before." Gulfport Energy is an independent natural gas and oil company focused on the exploration and development of natural gas and oil properties in North America and is one of the largest producers of natural gas in the contiguous United States. 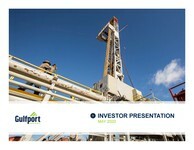 Headquartered in Oklahoma City, Gulfport holds significant acreage positions in the Utica Shale of Eastern Ohio and the SCOOP Woodford and SCOOP Springer plays in Oklahoma. In addition, Gulfport holds an acreage position along the Louisiana Gulf Coast, has an approximately 22% equity interest in Mammoth Energy Services, Inc. (NASDAQ:TUSK) and has a position in the Alberta Oil Sands in Canada through an approximately 25% interest in Grizzly Oil Sands ULC. View Annual Reports, SEC Filings, Latest Press Releases, Stock Information and more.